Give Personalized Aprons to your favorite Chef. 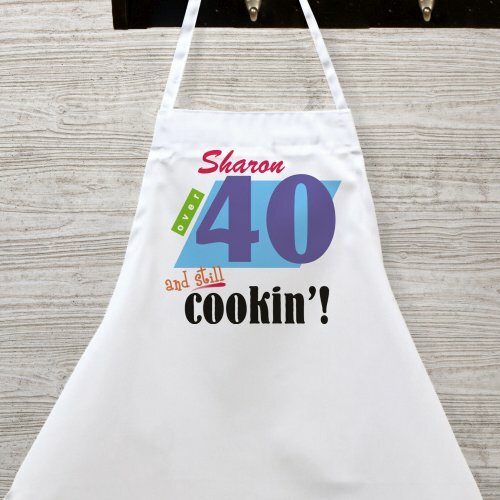 If they love to cook they will love celebrating a 40th birthday with exquisite food and fabulous company in this custom printed Happy Birthday apron personalized just for them. Our Personalized Still Cookin' Birthday Apron is a full length, 65/35 cotton/polyester twill fabric apron with matching fabric ties. Machine washable. This personalized chef apron measures 20" Wide x 30" Tall and features multiple pockets for convenient storage along with an adjustable neck strap for a comfortable fit. Includes FREE Personalization! Personalize your Birthday Apron with any name and age. 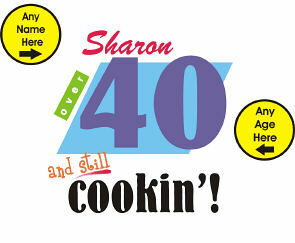 GiftsForYouNow offers a large assortment of Personalized 40th Birthday Gifts. And if you're looking for ideas for other milestone birthday gifts, we have you covered there too. Check out our personalized gifts for celebrations year round, you're sure to find something they'll love!